Notes: The down platform possessed a plain, partially rendered station house, and a separate waiting room block. Both were of brick construction with pitched roofs. A further brick-built waiting room block stood on the up platform. 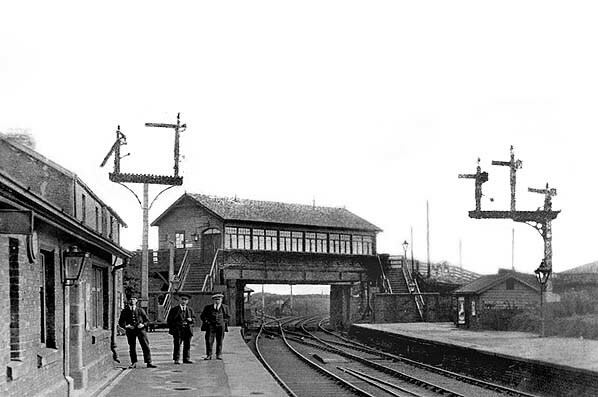 Both of the waiting shelters were constructed in 1885, when an overtrack building was also added adjoining the road overbridge at the north-east end of the station. This timber building contained the booking office; a long range of windows afforded a view up-line. The overbridge subsided in 1940, weighed down by a wartime barricade, and for many years girders supported it and obstructed the up line, so all trains used the down platform. 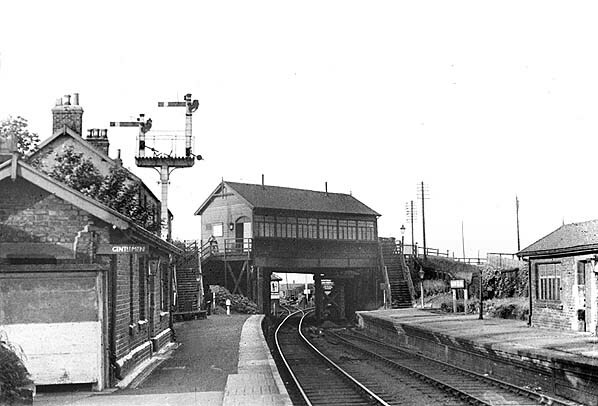 By 1961 the elevated timber shed had gone, the road bridge was rebuilt, and two-track working was resumed; the platforms and other buildings remained in place. The line is now single, and the station has gone. Immediately north-east of the road bridge the signal box was located on the down side, where an important mineral line swung off to serve not only Seaton Delaval Colliery but also collieries at New Delaval (one mile north-west of Newsham) and New Hartley. In 1911 the station served a population of 7,573. The principal goods traffic was bricks; goods ceased to be dealt with on 9 December 1963.
journey to Percy Main, three return workings, and an extra Percy Main-Seaton Delaval train. Ashington, Linton, Ellington, Lynemouth, Newbiggin, and Woodhorn collieries, and opencast mines at Longhirst (and more recently, Butterwell). The Alcan aluminium smelter, built in 1968, was also served. One further addition to the ex-B&T system was mooted in 1894, when the NER sought to build a Blyth-Cramlington line. Opposition by Lord Hastings, who feared losing revenue from ‘wayleaves’ on existing routes through his land, caused the Bill to be dropped. from Britain’s railways. 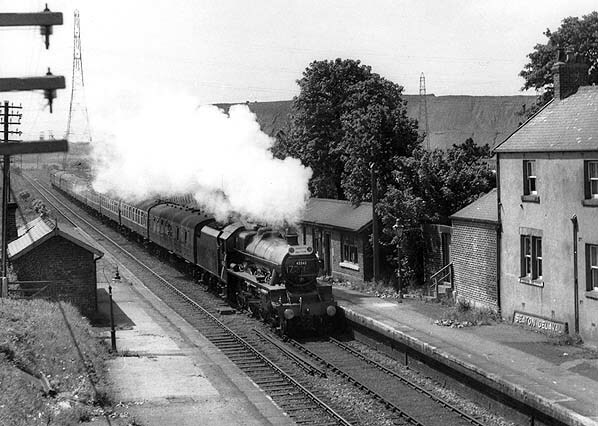 The ex-B&T system was no exception, with goods handling ceasing at all stations in 1963-65. Bedlington handled parcels traffic until 1966. By 1990 only coal, alumina, and aluminium were carried. West Blyth staiths closed in 1989, and a new facility opened at Bates in 1991. In 1980 a new curve between Hepscott North and Morpeth North junctions allowed direct access to and from Scotland. 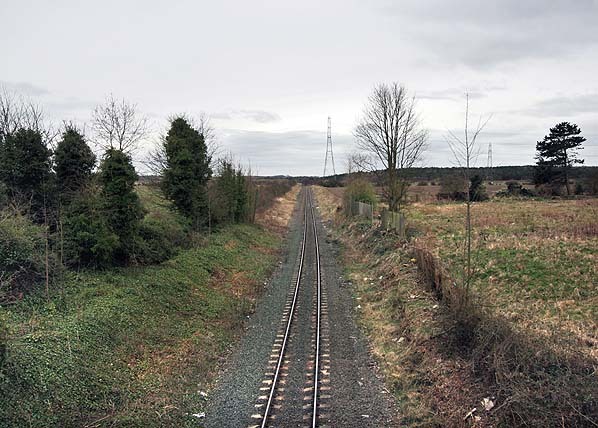 Former double-track sections were singled: Bedlington-Choppington (1973) and Newsham-Backworth (1985). 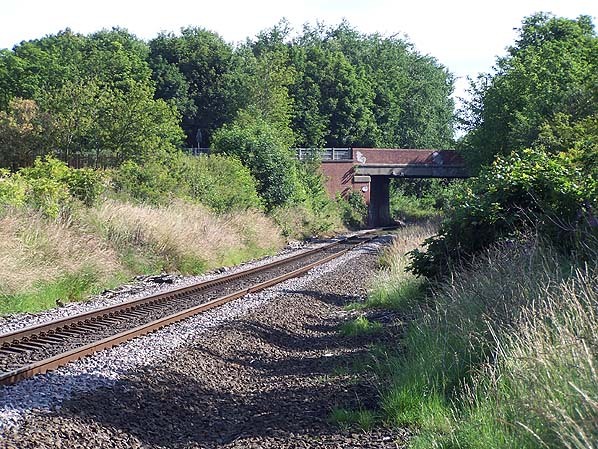 Since 1980 a new single-track has allowed independent working from Backworth to Benton Quarry on the ECML, avoiding conflict with Metro services. Tickets from Michael Stewart and JC Dean, 1865 B & T timetable from CJ Dean, 1906 Bradshaw from Chris Hind. Route map drawn by Alan Young. Hartley Pit, Hartley, Newsham, Blyth 2nd site, Blyth 1st site (on branch), Bebside, Bedlington, Choppington, Hepscott & Morpeth B & T.
1895 1:2500 OS Map. Only one ('down') platform is clearly shown on the map. However waiting shelters on both platforms and an overtrack entrance building had been constructed ten years earlier. 1922 1:2500 OS Map. The overtrack building, 'up' platform and its access path are now shown. The main building appears larger than on the earlier map. 1961 1:2500 OS Map. The track has been singled through the station, with only the 'down' platform in use. The 'up' track was removed when girders were added on its site to support the road overbridge which had been damaged in World War II. 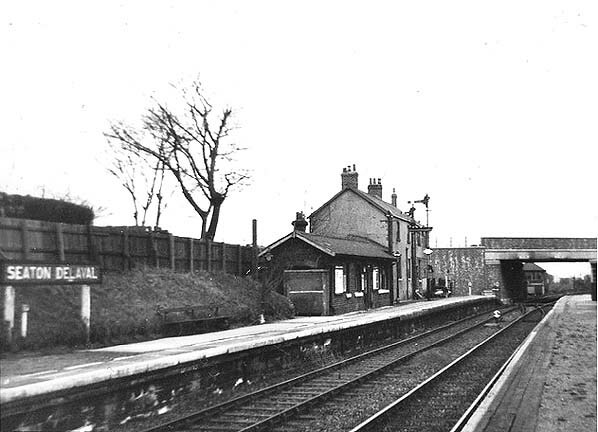 Seaton Delaval station c1908. The view is north-eastwards along the down platform, with the single-storey block in the foreground in which waiting and toilet facilities are found, and the station house is beyond. A brick waiting shelter is also seen on the up platform. The timber overtrack building adjoining the road bridge, was added in 1885 to provide both booking facilities and a footbridge. 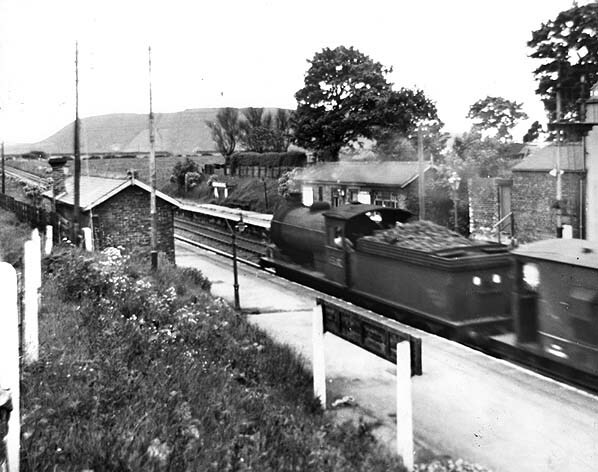 A coal train passing the down platform at Seaton Delaval c1950, looking south-west from the road bridge. 65810 entered service in May 1908. A J27, it was built for the NER by the North British Loco Company in Glasgow and carried the number 1014. Renumbered by the LNER to 5810, it received the ‘6’ prefix upon nationalisation and was finally withdrawn in December 1963 to be cut up a month later in January 1964. 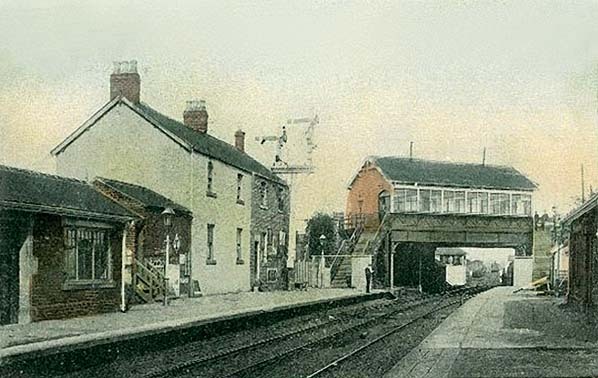 The station house is on the extreme right, with the waiting room and toilet block beyond. On the up platform, temporarily out of use as its track was obstructed by supporting girders supporting the bridge, a further enclosed waiting shed can be seen. 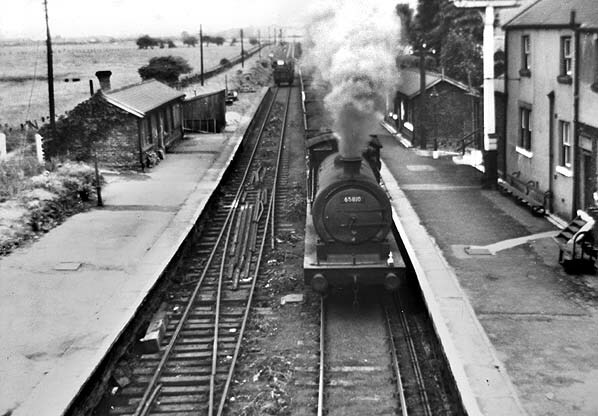 Seaton Delaval station, looking north-east from the down platform in June 1950. The booking hall is in the overtrack building. Owing to damage caused by a barricade on the bridge in World War II the bridge and building needed to be underpinned with girders, so the up line and platform were taken out of use, and all passenger traffic was handled on the down platform. A goods train hauled by a J27 passing the up platform at Seaton Delaval, probably in the early 1960s, after the up line was reinstated. In 1961 both platforms are back in use as the bridge has been repaired and the supporting girders, which occupied the position of the up track, have been removed. The overtrack booking hall has been dismantled. The LNER running-in board has an NER ‘DP’ (Distance Point) sign beneath it; these were generally about midway along a platform and the place from which distances along the route from each station were measured. 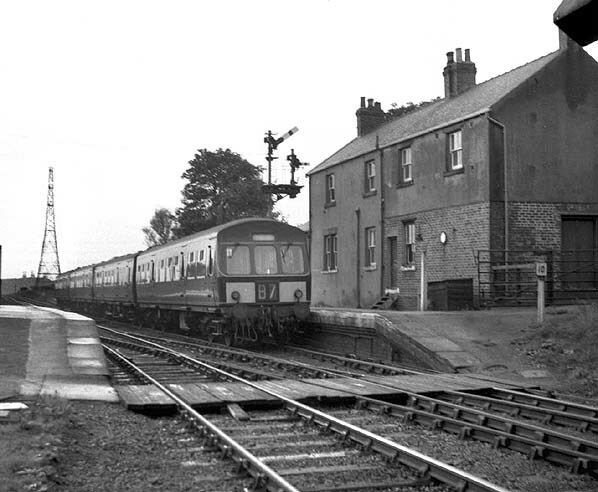 In October 1964, the final month of passenger train services, a DMU is calling at the down platform of Seaton Delaval station. By this time the station was used by very few passengers; indeed a survey of 1964 (prior to closure!) found that it had no regular users. 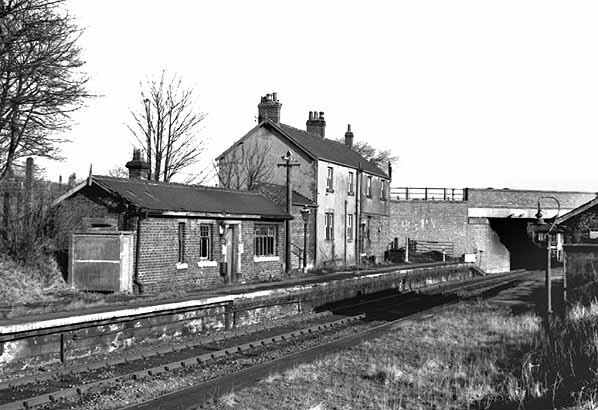 Seaton Delaval station is seen c1968 after closure to passengers, looking north-east from the up platform. By this time the road bridge has been rebuilt and the overtrack booking hall has been dismantled. 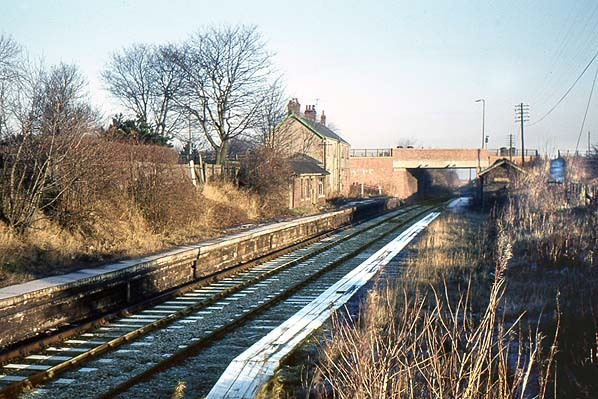 Looking north-east from the up platform at Seaton Delaval in December 1972. Buildings are still in place on both platforms. The site of Seaton Deleval station looking south-west from the road bridge in March 2009. A widening of the cutting is the only evidence that there was ever a station here. The site of Seaton Delaval station in July 2011. The up track has been removed. The station house formerly occupied the area on the left side of this picture.